The Bruins fell to the Colorado Avalanche 2-1 in tonight’s matinee, their third straight loss since the start of the season. The Bruins decided to mix up their lineup today, with Jordan Caron, Matt Bartkowski, and goalie Niklas Svedberg making their season debuts. The B’s recalled forward Seth Griffith from Providence in an attempt to add a spark to their offense, while Matt Fraser, Kevan Miller and Bobby Robins were the healthy scratches for today’s game. Most notably, David Krejci was added back into the lineup, fresh off the injury reserve list. The Bruins started off with a ton of energy, creating scoring opportunities early and often. The first power play of the game was awarded to the Avs, with a questionable interference penalty called on Brad Marchand. 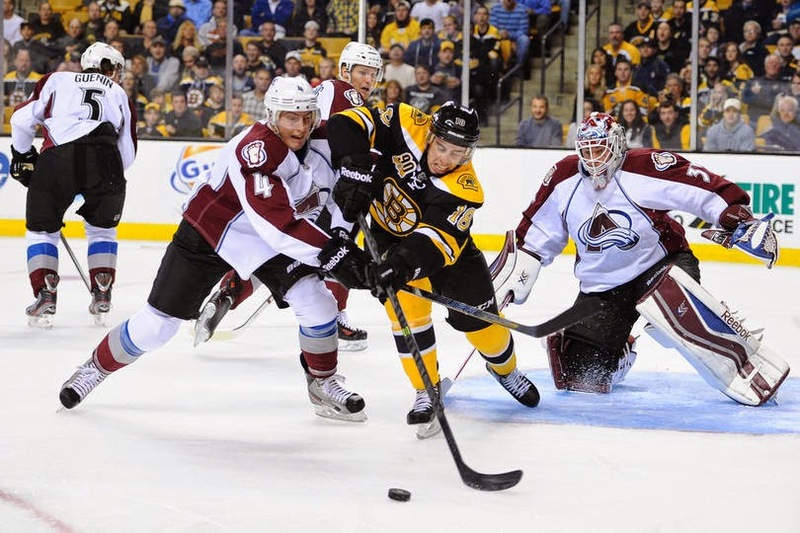 The best scoring opportunity came from Gabriel Landeskog, but Svedberg was able to successfully cover the shot. A few seconds after killing their penalty, the Bruins were sent to the power play, with Cody McLeod being called for a high stick on defenseman Adam McQuaid. They were unable to capitalize, and a slide from McQuaid quickly broke up a potentially dangerous 3-on-2. Colorado was called for too many men on the ice with one minute left in the first, but Zdeno Chara was called for tripping quickly into Boston’s power play to even the playing field. The game remained scoreless at the end of the third. The Avs scored their first goal of the season with Jamie McGinn beating Svedberg glove side to put the Avs up 1-0. Colorado was called for too many men on the ice for the second time, putting the Bruins on the power play once again. Loui Eriksson was able to get the Bruins up on the board with a calmly executed backhand. Soderberg had good net-front presence on the power play goal, picking up the rebound that Eriksson was able to capitalize on. McQuaid and McLeod went to the box after they dropped the gloves, exchanging some pretty hard shots. A roughing call on Dougie Hamilton sent the Avs on the power play, but they were unable to produce. The second period ended with a tie. In a very lucky turn of events, a Colorado deflection past Svedberg a little over seven minutes into the third was called off on the ice. The officials ruled it as being played by a high stick, keeping the game tied. Danny Briere scored his 300th career goal with 0.4 seconds left on the clock to win the game for Colorado. Talk hockey with us. Follow @ryescaf and the rest of the team @BruinsLife.